16th June ’13 – Hired as wedding DJ for Mr & Mrs Barber at DeVere Mottram Hall hotel in Mottram St Andrew, Cheshire. Fabulous leisure hotel for getting married at! & the weather was glorious too! 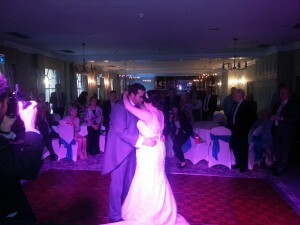 Their first dance was performed to McFly ‘All about you’. 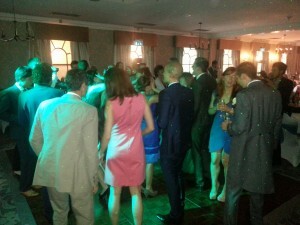 They’d then asked for ‘Brightside’ as a follow up track for guests to join in which they did! Thereafter it was party time! We had a short break for the buffet, but other than that, I played through till 1am with a mix of guest requests & several of my own wedding favourites! All the best to Mr & Mrs Barber! If you’re looking for an experienced wedding DJ for your big day at Mottram Hall, Cheshire, then email your enquiry to andy@andybevents.co.uk As a guide, expect to pay £295 to cover playing times of 7pm till midnight, then £30 per hour if you require any extra time for example to go on until 1am or to cover your wedding breakfast.